Wallyball Net Official "Pro Net" of The American Wallyball Association®. The AWA creates innovative, durable Wallyball equipment that will meet your needs well into the 21st century. 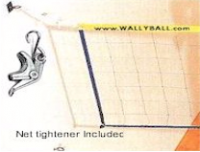 Our professional wallyball nets, are remarkably easy to setup and allow you to achieve superb net tension.